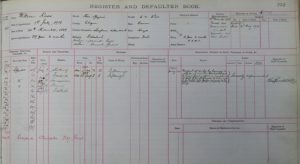 For October, our document of the month focuses on in fact many different documents relating to police forces in the area over the years are held at the Archives. These are some of the highlights of these collections, which showcase the variety of the records we hold for the police service. The collection spans a considerable time period with the oldest being a Committee minute book of Stirling Burgh police force, dating back to April 1823 (SB/18/1), and the newest, a Central Police Scotland annual report from March 2005 (Acc 1515). 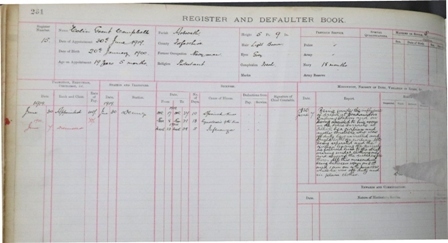 Police Committee and Commissioners minute books are a regular feature within these records. 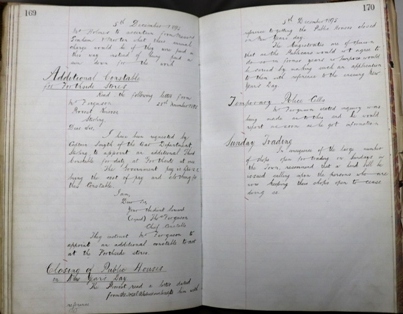 This Stirling Burgh Police Committee minute book entry dated 5 December 1895 (SBC/18/10) shows the types of situations that were being discussed at meetings and the issues that were to be addressed at this period in time. This particular volume is also indexed which is helpful in locating specific themes of discussion. The topics were varied, from tackling Sunday trading, the need for additional police cells and a letter from the “Total Abstinence Society” requesting the closure of Public Houses on New Years’ Day. The decision by the police to decline this request and not to keep Scots from their drink over the festivities was perhaps a sensible one! 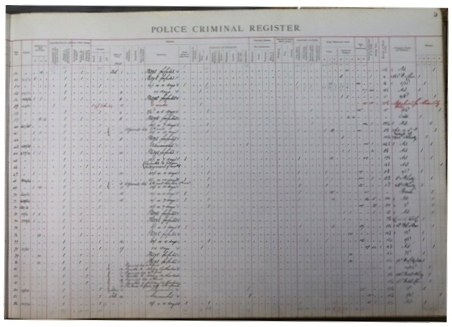 Stirlingshire Constabulary Statements of Information (Acc 1342) are interesting, detailed early accounts of crimes or incidents that we hold, with many featuring multiple documents which chart an enquiry from start to finish. This example from 1891 concerns the case of Robert Ferrier and his arrest for assault by stabbing. 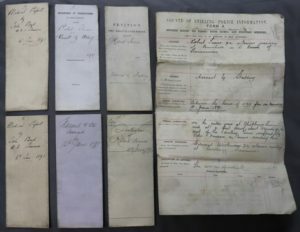 The photo shows some of the accompanying documents which include medical reports, the accused’s declaration and the procurator-fiscal’s petition against Mr Ferrier. The police statement includes many witness statements inside and details of those who provided them. From these, you can really get a good sense of the case as a whole and the many elements that follow an arrest and contribute to a criminal case. This is just a single entry from one of the four boxes worth of material in our care of the same vein. 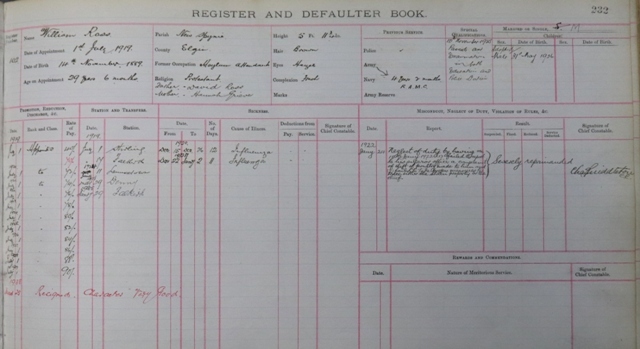 We also hold Criminal Register books with one such being that of Stirling Burgh police covering the years 1914 – 1921 (SB/18/1). These contain a wealth of information and we can really get a sense of the types of crimes and offences that were occurring. Everything is recorded chronologically and there is no difference for severity of crime, with those caught “committing a nuisance” next to those arrested for assault. The red entries are women which makes it easier to identify the ratios of men to women getting arrested and for what. 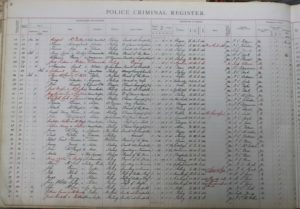 From this example dating from 1915, we can see how detailed the entries are with information including: date of arrest, name of individual, occupation, residence, crime or offence, personal details such as height, hair and eye colour and distinguishing marks. Police proceedings information then follows before sentencing and conviction details are then provided. An interesting column is that of an “under influence of drink at time of offence”, and in how many instances the answer to this is “yes”. 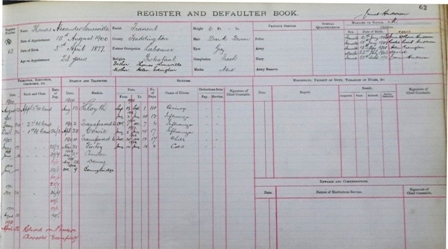 These volumes really provide a fascinating insight into who was in the Stirling and surrounding areas at this time with the birthplaces being extremely varied, and occupations ranging from miners to soldiers to housekeepers. 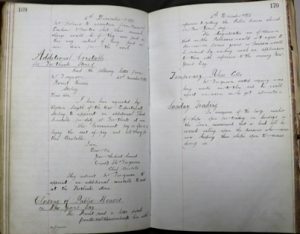 Schoolchildren also regularly feature in the volumes too for offences such as “stealing apples”, something which today may seem quite trivial but was essential in trying to maintain order in day to day life. 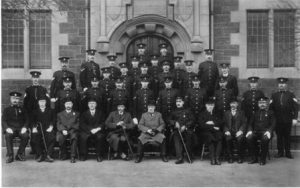 The spotlight now turns to the officers themselves in our Central Scotland Police Stirlingshire Constabulary officers’ register 1907-1939 (Acc 1392) with the history of each officer recorded which again include excellent depth of information. Personal details are noted in terms of appearance, family backgrounds and sickness records as well as entries regarding the career of officers where we can see the progression and commendations of some individuals, to the resignation or in some cases, even dismissals of others. 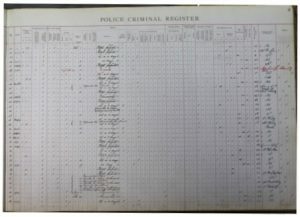 These have proved a popular genealogical resource with many enquiries from families who are interested in tracing details of their police officer ancestors. 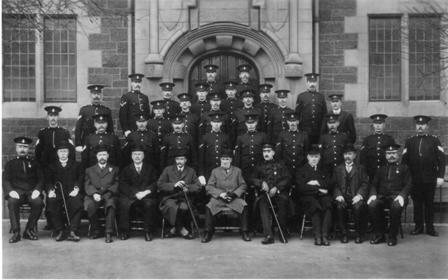 Photographs are not abundant in this area of our archive, but there are some gems such as this official photograph of Stirling Burgh Police force with the Provost, Magistrates and Town Clerk taken over the Christmas festive period of 1913 (PH/61/346). 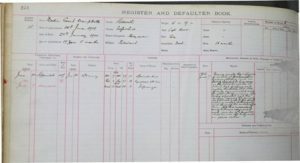 If you would like to see these, or any other of our police records, do not hesitate to get in touch with us. 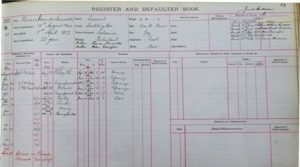 It is important to be aware however of restrictions on access to some of our records which may require additional permissions due to data protection legislation.